So you might remember that I was not a fan of Ari Marmell's Conqueror's Shadow. I've started to suspect that my dislike for that book might lie more with me than the actual writing, because I've since read another well received novel and had very similar problems with it. 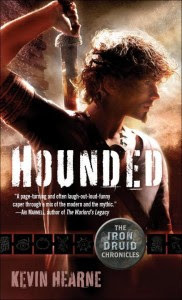 I'm talking about Kevin Hearne's Hounded. I saw positive reviews for it all about the place, with liberal usage of words like "clever," "funny" and "intelligent." But while I actually finished this one, I can't say that I particular enjoyed it. My biggest issue, as it was with Conqueror's Shadow, is that the author created a heavy back story for his protagonist, but it doesn't seem to weigh on the character at all. The hero of Hounded is Atticus O'Sullivan, an Irish Druid who's trying to lay low with his stolen sword in Arizona. He's also two thousand years old. Dude is older than Christ, not that you would ever suspect it. And not just because he's eternally 21 in appearance, but because his 2000 years of living haven't seemed to really effect him. I would think that living for a couple of centuries would make a guy question the point to life, make him wonder what comes next, that sort of thing. At one point he offhandly mentions that he fathered a son a few hundred years back, but it's not brought up again. Surely watching your own offspring grow old and die would mess a guy up a little? I'm not saying I wanted him to be as angst filled and existentially crises-ed as Anne Rice's vampires, but I would have liked to see him be a little darker as a result of his extended life span. But not so. Early in the book he bargain's to extend his lie even further, and no real motiation is given for this. Now, if you were dealing with a character facing a human life span you'd probably get away with that, the motivation would be obvious. But Atticus has already lived for 2000 years, honestly I would expect a little more. Is he that terrified of dying? Does he have unfinished business on the mortal plane? Nope, he's just wants to keep on living. Or something. The decision is literally given zero explanation, as though the reasons should be totally obvious. It all seemed just a little too shallow and light to me. I couldn't really believe that a 2000 year old druid would be as happy as Atticus. The guy runs an occult book store and sells teas with names that are really, really, terrible puns. He's been doing this for a while, and doesn't seem at all bored with it. Admittedly, we do get little hints of a less breezy side of him. He's extremely paranoid for example, but his paranoia seems only to benefit him and certainty we don't see it having any negative effect on his life or relationships which realistically it would. There's also one moment where we briefly mentions that if came down to living or dying he would easily abandon his friends and his beloved wolf hound to die. Now that fascinated me, and was exactly the kind of darkness I would have expected to see more of. It's obvious that Atticus places living above all else, I just wish we got some hint as to why. Maybe in future books? But as I said as the start of this review, I'm fairly sure the problem here lies with me. Most people seemed to really enjoy this book, and it is an easy read. It sets out to be a light and entertaining read, and it hits that mark perfectly. It's me that wanted it to be something else. If you're the kind who tends to over think stuff, you might be the same.